ELO Again will also be headlining a three  night ELO themed weekend mini-cruise departing from Southampton on Saturday 20th June upon the Fred Olsen liner "Balmoral". The cruise will call in at Zeebrugge in Belgium [for a trip to the beautiful city of Bruges] and also the French port of Le Havre before returning home on Tuesday 24th June. 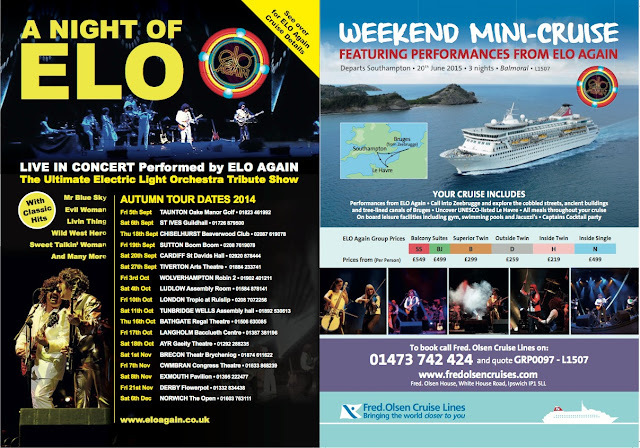 Special prices are on offer for ELO Again fans ranging from £219 to £549 per person. Performances by ELO Again and all meals/tours are included in the cost. The special rate can be obtained by calling Fred Olsen Cruise Lines on  742424 quoting: GRP0097-L1507. See the poster below and/or visit the official ELO Again web site for further details.